We have featured lots of Maxillarias on 365 days and this is one of our favourites. 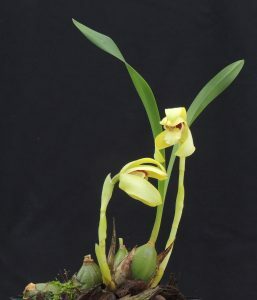 Maxillaria porphyrostele was one of the first orchids to arrive at the Writhlington School Orchid Project in the early 1990’s and it is still going strong although it has been divided many times. The species is native to cool mountain forest in the Mata Atlantica Brazil and we have seen similar species in the mild where they grow tight to the trunk and lower branches of trees in primary forests that have a wet summer and a cooler dryer winter. We grow the species in our Cool America section in pots and baskets with free draining compost but heavy watering during the summer months when in growth. 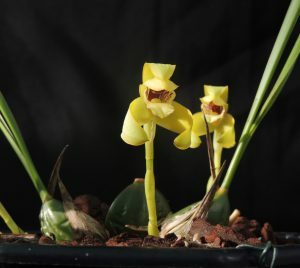 The 2cm pseudobulbs mature in the autumn and flower spikes appear from the base of the newest bulbs in early spring, each with a striking sulfur yellow flower. Looking closely into the flower reveals the purple column which gives the species its name (Porphyrostele = purple columned). The purple extends around the base of the lip too. The flowers are long lasting if plants are kept dry when in flower.